SHE was once dubbed ‘Britain’s Most Wanted Woman’ – playing an intriguing game of cat and mouse with the authorities during several years on the run. The former public schoolgirl and daughter of a prominent Conservative MP, she remained infuriatingly elusive, living out a Bonnie and Clyde-style fantasy with her lover, a convicted drug smuggler. Sought over fraud charges, Fiona ‘The Cat’ Mont, as she was dubbed in the British press, finally resurfaced in 2003 to face the allegations against her. But after discovering that the charges had been dropped, Mont, 41 – who was the subject of appeals on TV programmes Crimewatch and Britain’s Most Wanted – went to ground again in an apparent search for the quiet life. Now the attractive brunette is back and once again courting controversy after resurfacing in the British enclave of Gibraltar. In something of a further fall from grace, since attending a £7,000-a-year public school in Brighton, she has landed a job working as a ticket tout for a local boat company. Going by the name Fiona Hesketh (having apparently married her ex-con lover Graham ‘The Baron’ Hesketh) the mother-of-two spends her day drumming up business for dolphin watching tours around the celebrated local Straits. Wearing the bright blue colours of Dolphin Safari, she and her husband – who rides a bike and keeps in touch with her via walkie talkie – have the unenviable job of enlisting tourists on the daily trips that cost around £25 per adult. But things have not exactly been going swimmingly and unfortunately in their zeal to capture an ever-dwindling pool of clients, they have once again showed that time has not diminished their appetite for a brush with the law. Indeed, the pair have become embroiled in what is being dubbed locally as ‘Dolphin Wars’. The controversy came to a head last week when Graham Hesketh (left) was found guilty of intimidation after sending an apparently threatening email to the owner of a rival company. Despite being reluctant to comment on the case, Fiona Hesketh confirmed that her husband had received a £700 fine from Gibraltar Court and claimed it is ‘the strangest thing I have ever heard’. 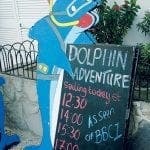 The claimant in the case, Tony Watkins, owner of rival company Dolphin Adventure, himself apparently no angel, revealed that he had taken out the case after constant harassment from the pair. He revealed: “I’m pleased we have got a result but the situation has actually got worse, if anything. It is the sort of mess that has sadly followed Fiona Hesketh around for much of her life. 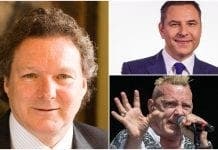 The daughter of the former Conservative leader of East Sussex County Council Joan Mont, she was allegedly expelled from her school St Mary’s Hall before becoming embroiled in an alleged £300,000 fraud involving the sale of computers. However, when suspicious detectives finally raided two containers rented in Mont’s name, they found them completely empty except for two pieces of paper with nothing more than ‘smiley faces’ drawn on them. Police arrested her regardless and charged her, but in December 1999 after being released on bail she somehow managed to slip out of the country in a private plane piloted by her lover Graham ‘The Baron’ Hesketh. It soon emerged that she had faked her own death by abandoning her car at Beachy Head, a notorious suicide spot. the British public and press for several years. The couple spent the next five years on the run, travelling around in an old Land Rover and living out of a dingy caravan, remaining one step ahead of the authorities despite Interpol issuing an international arrest warrant against her. The pair managed to flee Holland just before a police swoop and were finally discovered – thanks to the Daily Mail – living on a campsite near Mijas in 2002, in what appeared to be a sorry end to their extraordinary story. Going by the name Jacqueline Mayhew, she and her partner had claimed to be running a private detective agency and were clearly on their downers. But Mont got lucky and after being banged up in a Spanish prison to await extradition to the UK, she was inadvertently released on bail by a Spanish judge and promptly disappeared again, to the disbelief of furious British cops. Mont – whose Twitter account still wryly states her interests as ‘travelling, Crimewatch and escapology’ – eventually returned to the UK to discover that the arrest warrant had expired and the charges against her had subsequently been dropped. But after a few years apparently living back home in Sussex, the allure of life back in the sun got the better of the pair and they headed south again. Setting up in Gibraltar, Fiona initially got a job working nights as the deputy manager of a bowling alley, but eventually joined her partner in the dolphin business. The feud began last year when Graham Hesketh was arrested for allegedly taking photos of the Dolphin Adventure boat. It came to nothing, but their own company Dolphin Safari was then temporarily closed down earlier this year amid claims of irregularities with its paperwork, claims which proved to be unfounded. It is certainly anything but a glamorous operation. The company, which is actually owned by a seasoned sailor called Tim Montgomery, operates out of a scruffy office tucked away in a side street off Gibraltar’s main Ocean Village marina. When approached Montgomery tried to brush off the case, shrugging his shoulders and insisting it had nothing to do with him. He said: “I have nothing to do with the internet side or marketing. That is all dealt with by Fiona and Graham. His company later released a statement, supporting the Heskeths. It read: “Graham Hesketh is the last in a long line of dedicated members of Dolphin Safari to have come under attack by Dolphin Adventure. Certainly there seem to be few olive branches being offered in the ongoing ‘Dolphin War’ this week. The pair were both on the streets touting again for business…happily mixing it up – even towering over their rival tout, wearing a bright yellow shirt. Either way, it is not always a lucrative operation, with sometimes neither boat managing to get enough punters to justify going out. By mid-afternoon the couple had given up and disappeared, with no sign of them at the office. and Graham had both ‘drunk two glasses of wine’. Fortunately however, her continuing saga can be easily watched through a series of rather bizarre YouTube posts. Taken over the last couple of years – and with frequent references to the couple’s past – the colourful, sometimes risque, clips bemoan the ongoing conflict. Even more considerately, they decided to make a post this week, in which Fiona, smoking heavily, expresses her exasperation at the bickering. “I don’t know who you turn to under these circumstances…I’m at a loss,” she told the camera. Whether true or not, she is now very much back in the public eye which may of course, suit her. And while she may no longer be battling with authorities in the UK, it seems The Cat is not content to go quietly as she fights a new Waterloo in the tiny British enclave. What a great yarn. She never wears with age or spirit, what a fantastic figure. Well said Olive Press, you got this one spot on, can’t wait for the follow up story on Tony Watkins and Co……..
No-one can ever say the Olive Press comes under pier pressure! A well-written and documented article… CONGRATS JON! Sadly for Gibralter, they have the problem.